With the same prescience and eye for telling detail that distinguished his bestselling Balkan Ghosts, Robert Kaplan now explores his native country, the United States of America. His starting point: the conviction that America is a country not in decline but in transition, slowly but inexorably shedding its identity as a monolithic nation-state and assuming a radically new one. 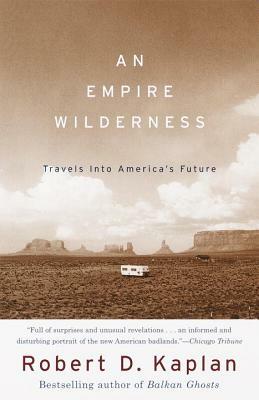 Everywhere Kaplan travels--from St. Louis, Missouri, to Portland, Oregon, from the forty-ninth parallel to the banks of the Rio Grande--he finds an America ever more fragmented along lines of race, class, education, and geography. An America whose wealthy communities become wealthier and more fortress-like as they become more closely linked to the world's business capitals than to the desolate ghettoes next door. An America where the political boundaries between the states--and between the U.S. and Canada and Mexico--are becoming increasingly blurred, betokening a vast open zone for trade, commerce, and cultural interaction, the nexus of tomorrow's transnational world. Never nostalgic or falsely optimistic, bracingly unafraid of change and its consequences, Kaplan paints a startling portrait of post-Cold War America--a great nation entering the final, most uncertain phase of its history. Here is travel writing with the force of prophecy.